In the swirling volcanic steam and misty rain forest of KĪlauea volcano's east rift zone on the island of Hawai‘i, two forces meet head on. 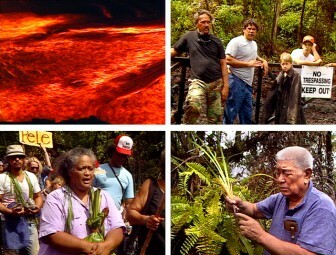 Geothermal development interests, seeking to clear the rain forest for drilling operations, are opposed by native Hawaiians seeking to stop the desecration of the fire goddess, Pele. Pele is a living deity fundamental to Hawaiian spiritual belief. She is the eruption, with its heat, lava and steam. Her family takes the form of forest plants, animals and other natural forces. But geothermal development interests see Pele as simply a source of electricity. When Hawaiians take the issue to court, they find that nature-based religions are not respected by U.S. law. Adding to the issue are environmental concerns over the threat to native species of plants and birds in an island group that is the world capitol for extinct and endangered species. The fact that the geothermal wells are situated on one of the most geologically unstable areas of the planet leads to safety concerns for the surrounding residential communities. Thus the stage is set for one of the most controversial issues ever to rock Hawai‘i, an eruption exceeded only by that of Pele, who has been dancing on the east rift zone since the controversy began in 1983. Produced for the Pele Defense Fund as an appeal for help to stop geothermal test drilling in the Wao Kele o Puna rainforest. Palikapu Dedman, Pua Kanahele, Noa Emmett Aluli, Henry Auwae, Davianna McGregor, Paul Takehiro, Tom Luebben, Alapai Hanapi, and Kaolelo Ulaleo.